Fabulous Selection of a Jewish gift for every occasion. Shop online for any occasion. 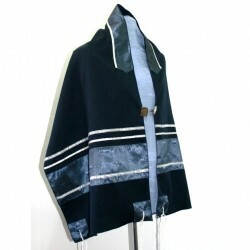 We take pride in providing a jewish gift ware from Israel on Sale all throughout the year. We carry presents that befit every occasion and available across many categories. Are you in search for a hostess gift ? You can buy a challah Board, challah cover, Judaica Art, or a fine piece of cutlery , a Kosher kitchen item or Israeli souvenir. We carry thousands of products online. Begin by clicking one of our major store categories above. We ship worldwide and offer a best price , quality and service guarantee. Try us – and you’ll never look back ! Let us suggest some of our post popular shopping categories for you. Judaica – First of all, explore our Judaica where you’ll find your favorite Challah Boards with matching Challah Covers and Challah Knives. 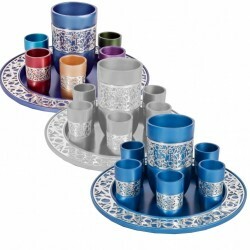 Spectacular Havdallah Sets and Besamim holders. Kiddush Cups, Wash Cups, Wine Fountains , Candelabras, Tzedakah Boxes, Blessings for Home decor and Office, Keychains, Mezuzahs, Shofars, Torah Yads and Keychains. Party Supplies: We carry balloons for every occasion both latex and foil. We create custom centerpieces, and table favors. You can’t make a simcha without visiting our party supply department. 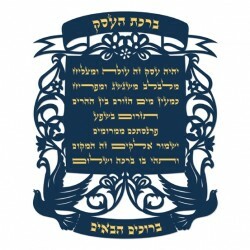 Memorial Items: Death is very important in Judaism. 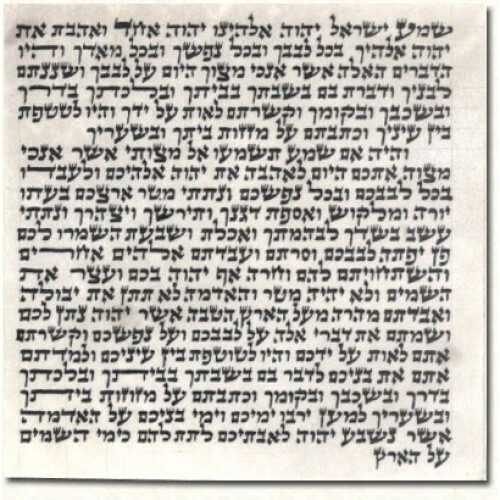 Here too you may order kippahs and printed booklets. We carry memorial candles both candle and electric. Velvet casket cover and inquire to arrange a tombstone delivered to your cemetary. Shabbat: We carry beautiful Challah boards, Challah Knives, Havdalah Candles and Sets, Plata Covers, and an array of unbelievable Shabbat Hostess present ideas. Don’t forget to check out our Tableware department where we feature beautiful wine sets, kiddush cups, wine fountains, Salt & Pepper cellar sets, cordial sets, and cuttlery & knives. Secondly, is jewish jewelry, an ideal gift for all occasions and simply the best selection and price value on the net. Always a safe bet for everyone without necessarily the price tag. Beautiful Hamsa Necklaces, Star of David Necklaces, Kabbalah Jewelry, Evil Eye bracelets and Tree of Life Jewelry and much more. In addition we present the Jewish Event Life Cycle . Filled with giving ideas and events. From birth of a baby boy which celebrates a special brit milah or more commonly referred to as a bris circumcision and a baby girl which too has festivities in giving her a name. We sell Brit Milah Pillows, Cards, Pins, kippahs and much more. Then.. Bat Mitzvah Ideas. We carry a beautiful selection of Bat Mitzvah ideas for the graduating Bat Mitzvah Girl. Click the Bat Mitzvah Category and shop by budget. We offer Bat Mitzvah Invitations , and personalized Bat Mitzvah presents. Embroider a special idea here. 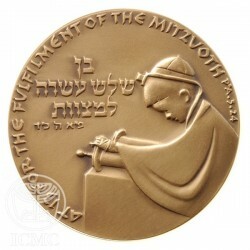 Bar Mitzvah Ideas: We’ll take care of your Bar Mitzvah with the best printed kippahs in the business, printed benchers, bar mitzvah invitations, and unique bar mitzvah gifts such as graduation coins, chess sets and many more. Wedding : Your wedding is special and here we celebrate with you offering a spectacular array of supplies beginning with printed kippot and printed benchers. We have a gorgeous selection of Ketubah prints and an amazing array of wedding canopies called “the Huppah”. Our most popular economical chuppah is the extra large tallit chuppah with special fringes and in a super size. Click on our wedding category above to explore. Rosh Hashanah Ideas : We carry an amazing selection of gift baskets, honey and honey dishes, holiday cards and benchers of the simanim for the rosh hashanah table. 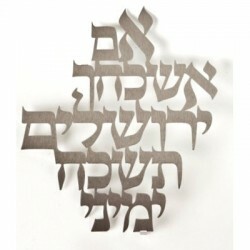 New this year, we have Rosh Hashanah simanim plates. Presents you’ll fall in love ! check them out. Yes, as is apparent, we are specialists suppliers for every holidays, event, and occasion. 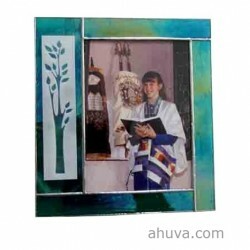 Shop online today for Hanukkah, Purim, Passover, Israel Day, Shavuoth and more. Featuring Judaica art, Home decor, tableware, wall hangings, picture frames, blessings, door signs, candelabras and much much more. Wonderful unique selection of items specially for him.